Are you ready to get this cruise vacation started for real? If you read my last post, I didn’t even make it off the boat, yet! Haha – but never fear, not only did we make it to dry land, we soared over it, laid on it andsnorkeled around it. 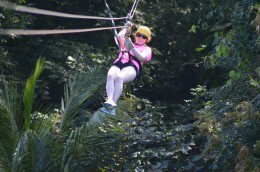 Don’t miss my latest excursions on our Caribbean Carnival cruise. How can this not intrigue you? Newly engaged (and deliriously happy from it), the first thing I wanted to do after saying yes and kissing Sean, was tell my family. In case you don’t know, my family is extremely important to me. I probably can’t stress that enough. So as soon as it happened, they were the first people I wanted to tell, but the problem/greatest thing ever about being on acruise is the lack of internet… Yeah… Ok, first thing in the morning, as soon as the cruise came into port at Costa Maya, we were finding the nearest wi-fi hotspot and calling home! Finally, as we headed back towards the boat, we came upon a little strip mall store that offered international calling and wi-fi access. The international calling consisted of a telephone in the office that could dial long distance, but it worked. As soon as I got my parents on Facetime and told them I burst right back into tears (tears of joy), my mom did too, and the same thing happened with Sean’s mom as well. Mission successful. That morning of excitement really took it out of us, so we returned to the ship shortly thereafter, had lunch, took a nap and relaxed the rest of the day. Our next day, we were docked in Isla Roatan, the little island off the coast of Honduras, and we were scheduled to go ziplining through the jungle canopy and then hang out at Tabyana Beach afterwards. 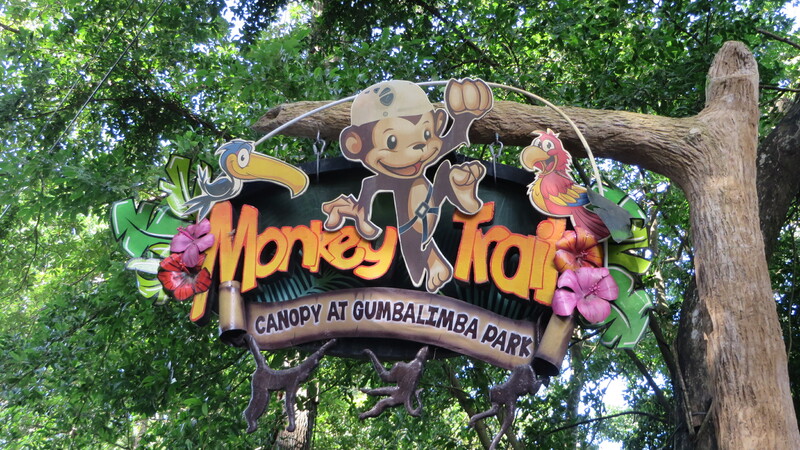 After disembarking onto the mainland, we were ushered over to one of many little signs set up in the tourist port for our zipline adventure, then our group was lead to a large van which took us deep into the mountains of Roatan, to a national forest preserve called Gumbalimba Park. 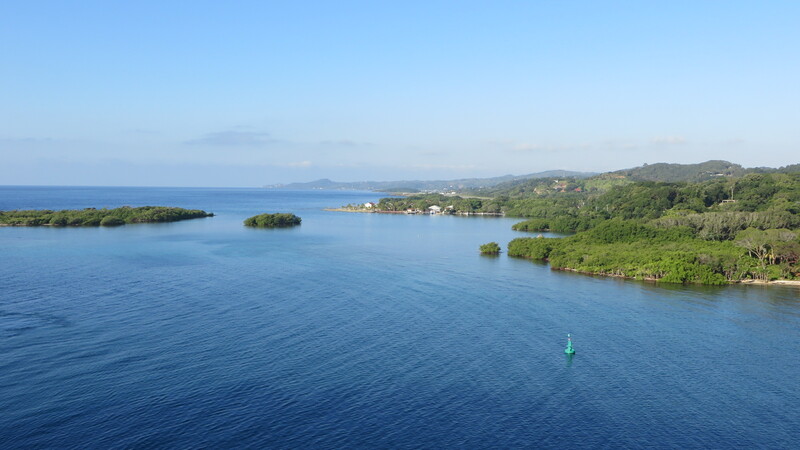 The look and feel of Roatan reminded me a lot of my visits to Trinidad, and it was a gorgeous, lush island and jungle that we drove into before coming to a halt near the Monkey Trail, our zipline purveyor. 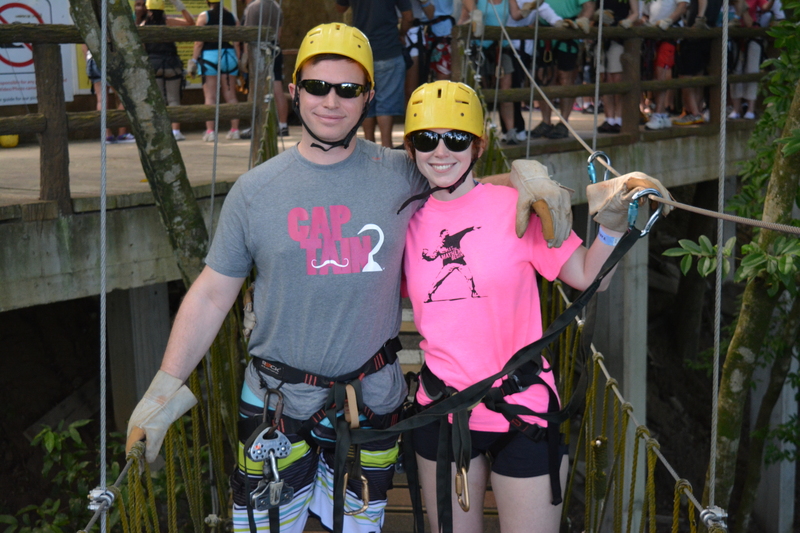 After a short do’s and don’ts from the zipline manager, we were all suited up in harnesses, helmets and gloves and sent whizzing off into the trees. Sean and I got to be the first two down, and it was such a blast! I had so much fun flying along, seeing the gorgeous views around me, it was awesome!! We’re suited up and ready to go! 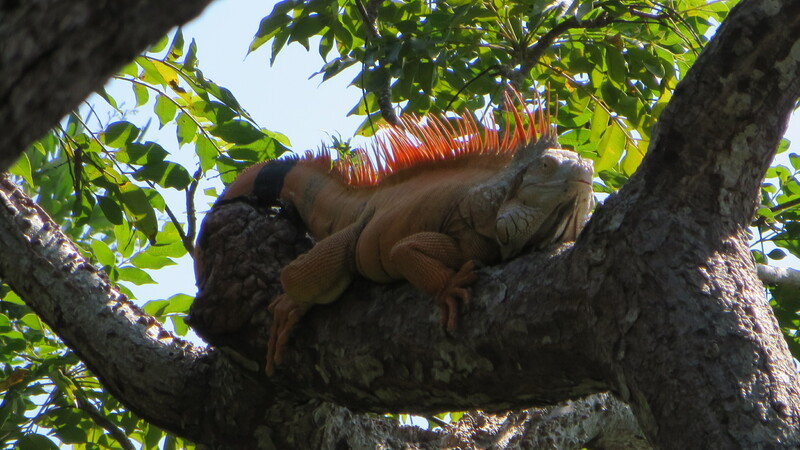 When we finally landed after the last zipline down to the ground, we were right at the entrance to Gumbalimba Park, and just a short walk away was an iguana nest, including a big orange iguana I’d sailed over just minutes ago sunning itself in a tree underneath the zipline ropes. Pretty cool! After our whole group was down, we were ferried over to Tabyana Beach, a sparkling white sand beach with palm trees, coconuts and lots of sun chairs. After testing out the water, and finding it was still pretty cold even this far south in the Caribbean, Sean and I chilled on the beach for a bit, then we caught one of the buses back to the port and got back on the Carnival ship. What a day! Man! That was so much fun!! We both had a great time! The next day, we were anchored a little way off the coast of Belize. 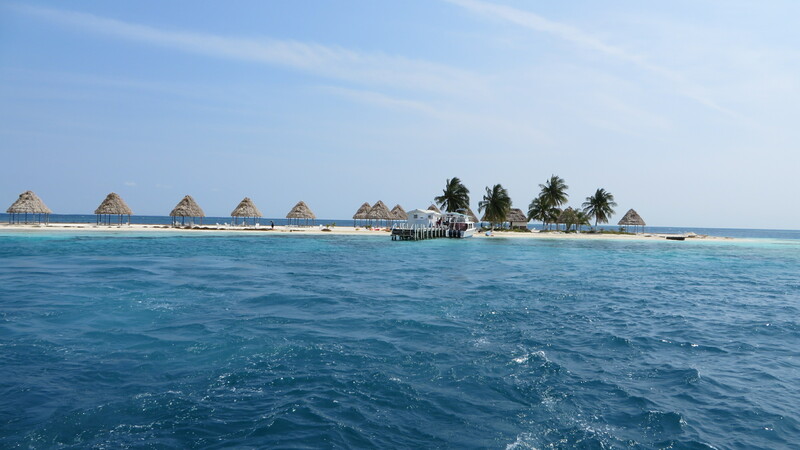 Belize’s barrier reefs are so large they’re second only to Australia’s, but because of this, big cruise ships can’t dock in port, instead, they have to send little boats up to the ships to ferry people back and forth. Since Sean and I were going snorkeling, though, we didn’t have to worry about that at all. 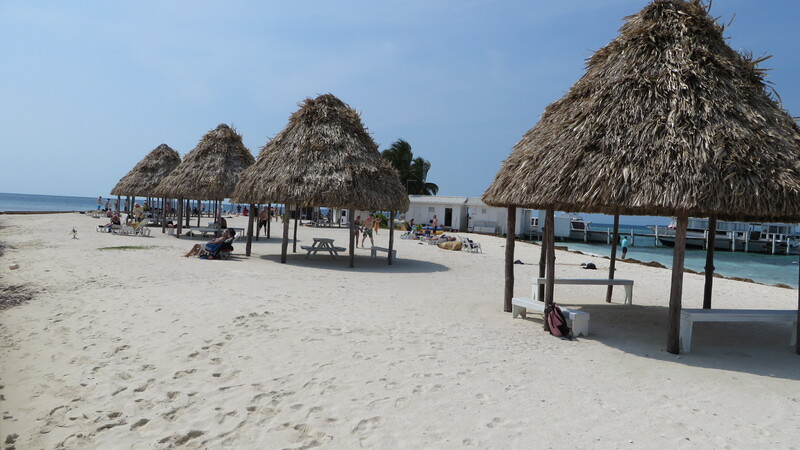 As soon as were loaded onto our boat, it took off for a tiny little spit of land Carnival had purchased called, Rendezvous Caye, which we’d snorkel around in the surrounding reefs. We were told 75 percent of this little island was actually made naturally. The weather the night before had been a little stormy so the water wasn’t as calm and clear as we’d hoped and the wind was howling, but despite that, Sean and I were donning snorkels and fins in no time and soon bobbing along with our group of 20 or so other snorkelers. Our guides were excellent showing us tiny jellyfish (which had no stingers, so I touched every one I ran into), sea cucumbers, starfish, coral and tons of other stuff. It was fantastic! After we’d had enough salt water and buffeting by the waves, we lounged on the island taking in the sun, the sand and the tiny little palm trees starting to sprout. By the time we pulled away from the island and got back to the cruise I was beat – and it was only 2 PM, but I tell ya, these shore excursions Carnival has going can really take it out of you. What great ways to see my first glimpses of Honduras and Belize though, after those little tastes of what they had to offer, I couldn’t wait to go back for longer! 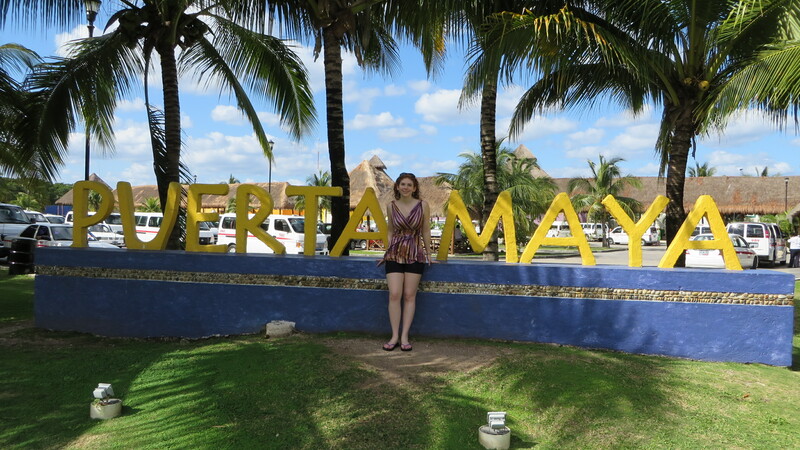 Don’t miss my final blog post as we went back to Mexico to finish up our weeklong cruise strong! Here’s the iguana just below our zipline course. This entry was posted in Belize, Caribbean, Honduras, Mexico, South America and tagged Beach, Belize, Caribbean, Carnival, Carnival Cruise, Costa Maya, Cruise, Engagement, Gumbalimba Park, Honduras, Iguanas, Jellyfish, Mexico, Rendezvous Caye, Roatan, Snorkel, Snorkeling, South America, Tabyana, Travels, Zipline, Ziplining on March 4, 2015 by Paige N..